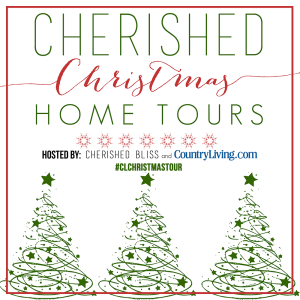 I’m SO PUMPED to be participating in the Cherished Christmas Home Tours hosted by Ashley with Cherished Bliss and CountryLiving.com! If you are coming here from the previous stop in the blog hop, Setting for Four, thanks for coming by! I hope you find something you love! 🙂 The link for the next home in the tour is at the bottom of this post. It is no small feat that I am here, showing you lots of pics of my cute little house, all decked out for Christmas. 🙂 It took several weeks and lots of effort (by the whole fam) to bring it all together, but I’m happy it is done and it really showcases some of my best work. My man, Alex. Alex is in 1st grade. He is a guy who loves routine, consistency, and soccer. He also pays attention to anything different and gives me compliments (or constructive criticism haha) when I move some furniture around, or make/paint something new. Oh and I’m telling you right now, I totally borrowed lots of decorating ideas from other people. Not much (if anything) that you will see is 100% original. I’m okay with that, because I still love how it looks. 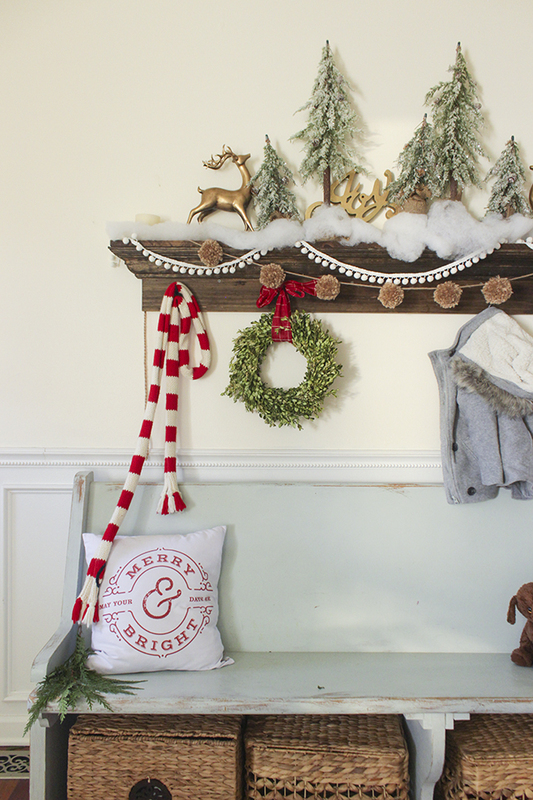 Like the yarn pom pom garland bandwagon? Totally on it. Only I went the cheaper route and made them (messy, but actually very fun to make). Merry & Bright pillow is from So Vintage Chic. OH I almost forgot to tell you! I changed or added something big in every main room within this past month. THAT is why I have posted like twice in the past few weeks. In the front room I moved the green painted sofa in front of the window (crazy I know), which caused me to move all the other furniture around! 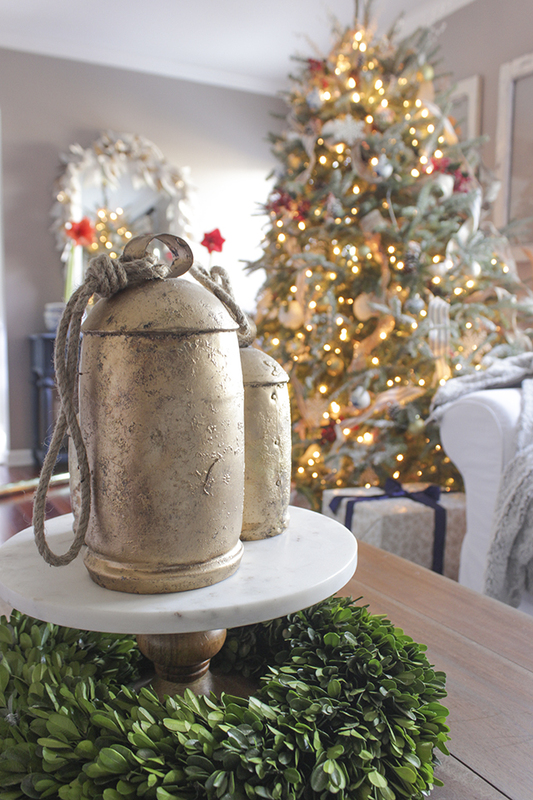 I also added a brass lamp, and got a new cable knit rug (Rugs USA), which I will share more about in an upcoming post. 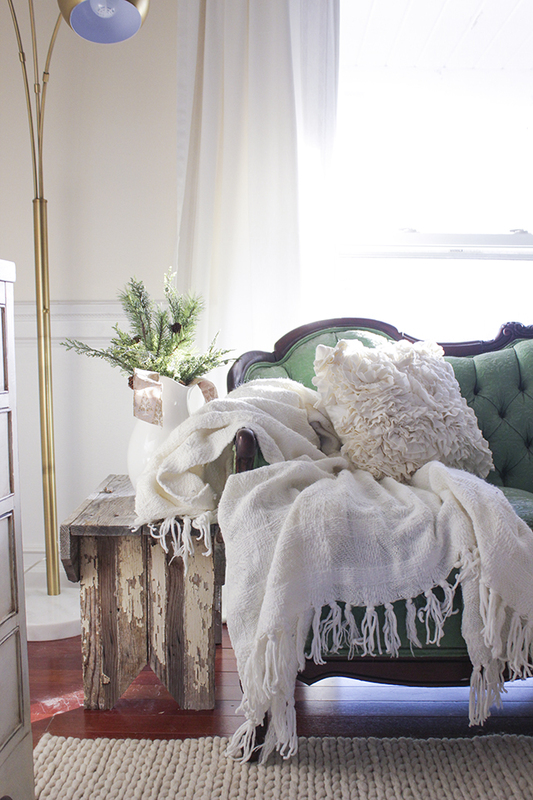 This dresser I held on to from the Spring Vintage Market Days is now sitting where the green couch used to be. I went SUPER simple with the decor on it: fresh wreath, dollar store nutcrackers under a cloche I already had, some walnuts in a tureen, and a wrapped gift. Paper snowflakes! Wheeeeeeeee! 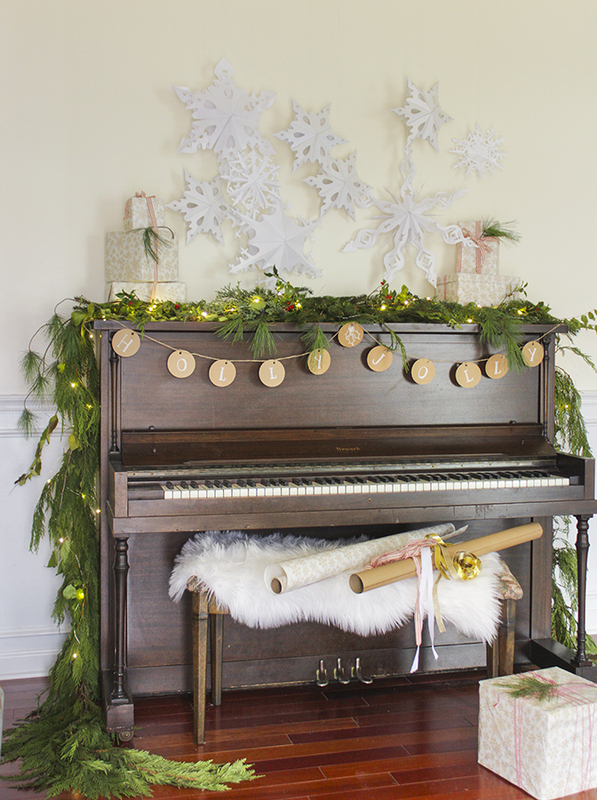 🙂 These are 3D ones I made (with a few Target ones in there) and I love the subtle texture and whimsy they add above the piano. The sweetest and spiciest 4 year old you will ever meet! 😉 Kaila (pronounced Kyla) is the BEST little friend to have home with you during the day.She will chat it up with you, but then disappear to host her own pretend video tutorials on how to brush Rainbow Dash’s hair, or make a Play Doh pizza. She also is so capable and loves to help me cook and clean (even though those are two things I really don’t enjoy, but she makes them sweeter). Naturally, she wanted to make blueberry muffins for the pictures. More to come on this kitchen, but it is finally done (besides the new hardware)! New countertops by Lumber Liquidators are in, sink, new faucet (Delta Faucets), ceiling fan by Lamps Plus, new backsplash, and can we get a halleluia for the kitchen island?! I designed and built that and will be sharing digital plans soon! 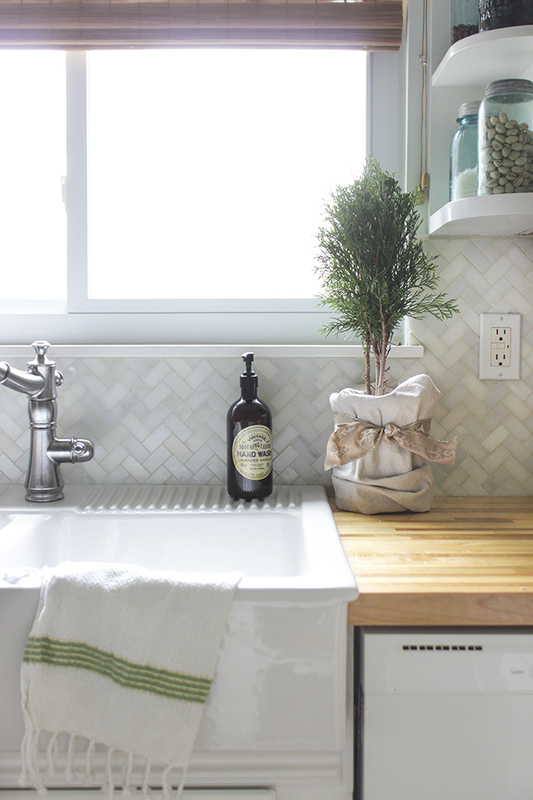 The tile back splash was one of the most laborious things I’ve done solo (Bruno had to study for finals). My arms are super buff right now though, so that is another payoff, besides the fact the back splash looks freakin sweet. I don’t think I’ve ever showed a landscape view from this vantage point, but it finally feels “done”, so here it is! The blue secretary makeover here. 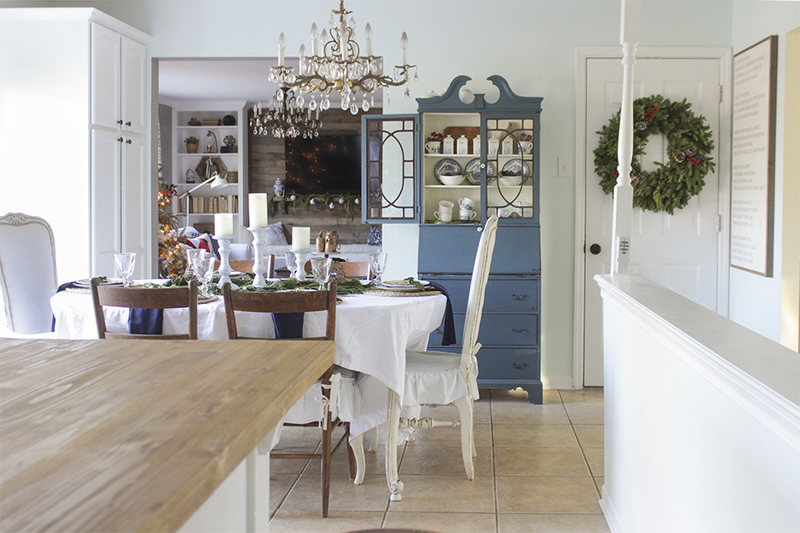 My farmhouse dining table makeover is here. 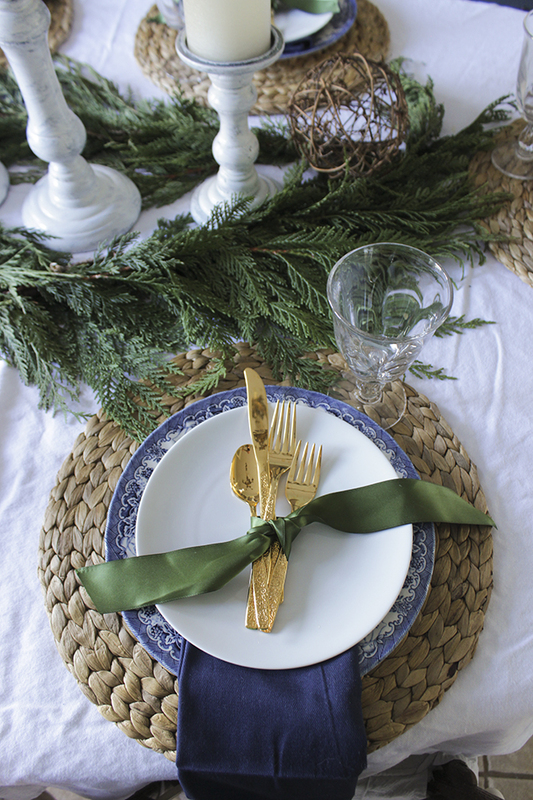 My Christmas tablescape this year revolves around navy and fresh greens. Navy is having a major moment in my heart this year. I love it with alllll the things. Another reason this room feels done, is the new word art that I received this past week from Between Me & You Signs. I’ll be doing a separate post on it soon because they have a special offer for my readers, and I know you will love it! Lastly, there is my oldest, almost 10 year-old (what-the-WHAT? How is that possible?! ), Owen. Owen is a rule follower, leader, worrier, sports fanatic, and loyal friend. He inherited my artistic talent and loves to draw, paint, and create when he has time. This picture makes me laugh whenever I see it because I they held these poses for several seconds while I was snapping away. Oh, I love my boys. I would be remiss if I didn’t mention Bruno. He is the hardest worker I know and rarely wants anything for himself. He helps me achieve my dreams and crazy schemes, whatever they are. He also has opinions about what goes on our walls (I don’t put up enough pictures of family apparently), and thinks I have too many pillows, but he actually has good taste and I often ask him for advice. He builds me up. So, in the past month I have pretty much finished our living room also. 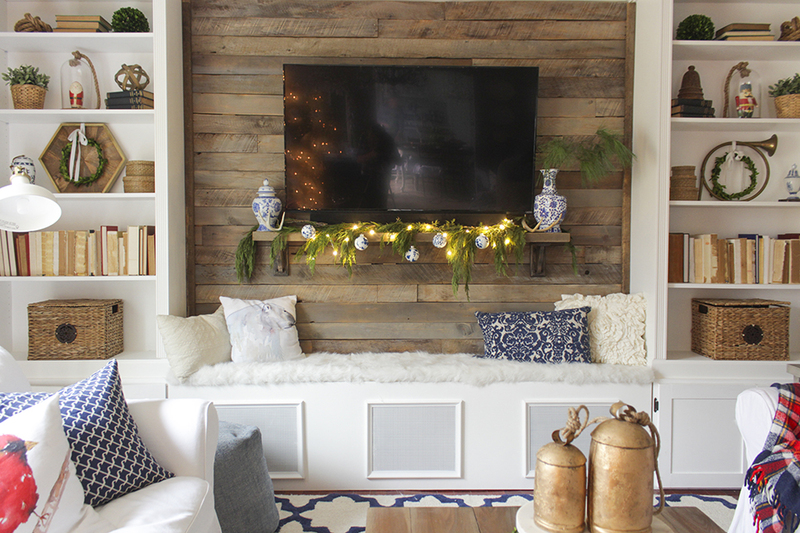 We built the pallet accent wall together, made the bookcase cabinet bases and made them look like built-ins, and just last Saturday I finished that bench between the two bookcases that holds the subwoofer and has compartments to hold extra home decor stuffs. It is not ‘built-in’, so can be easily removed if we decide we don’t want it there later on. But right now I’m really digging it. Polar Bear and Cardinal pillows are both from Craftberry Bush. Of course a season change calls for restyling of the bookcases. 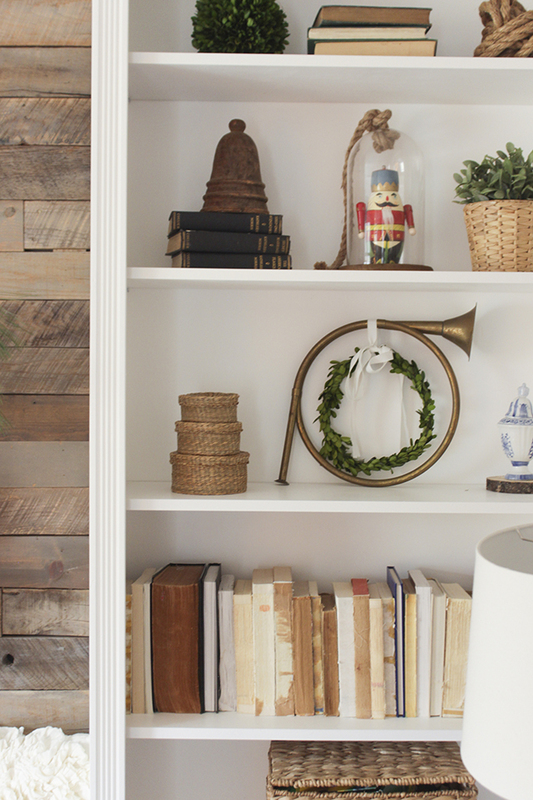 I think my favorite thing is this brass horn with a wreath hanging from it. 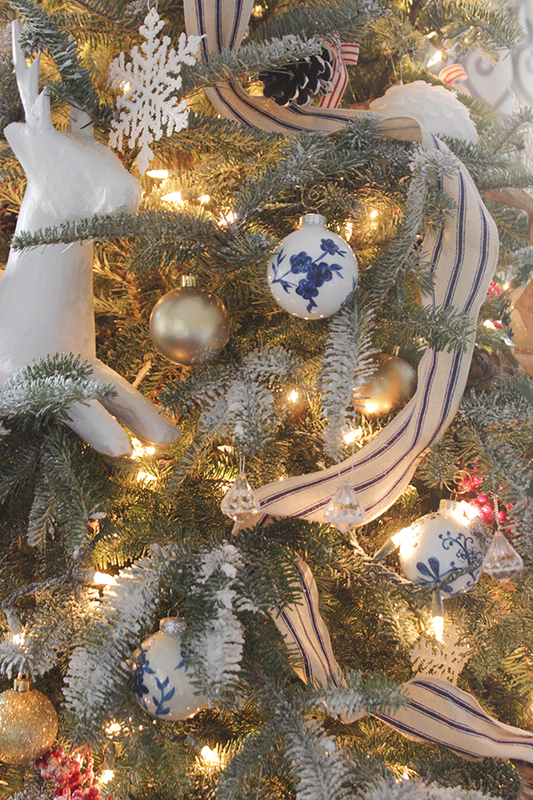 If you have visited my blog before, you will know I have a slight obsession with blue and white china and chinoiserie. 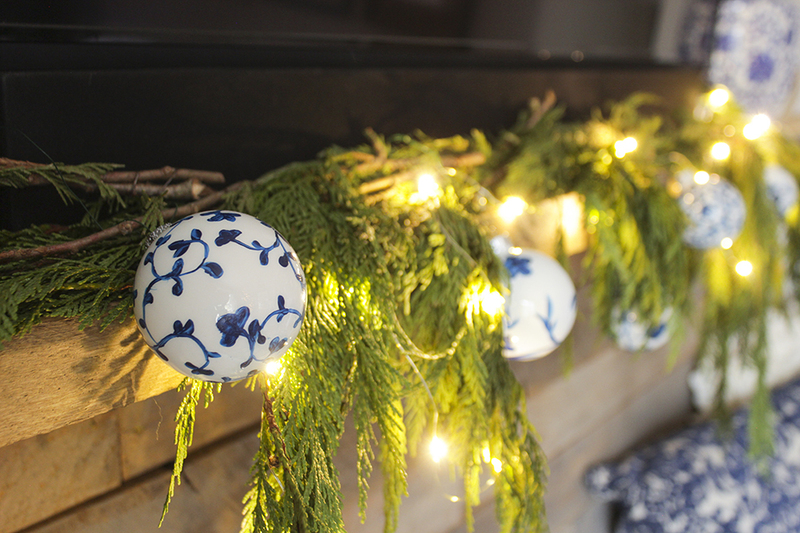 Well, my friends, I hand painted those chinoiserie ornaments and it is so very easy with a little practice and is my favorite hand-made thing this Christmas season. I have a tutorial on eHow with some more pics of them here. I’m loving red, white, navy and gold for Christmas this year. Very patriotic of me, no? 😉 Also my ribbon skills are seriously sub-par, but my friend, Kristen, from Ella Claire Blog saved me with some last minute tips and basically telling me I need to make the ribbon a little crazier. And now I love it! I got another real tree this year because, well… you can’t beat a $30 tree! I “flocked” it myself by using spray snow, which can get a little messy but once it dries, it holds up pretty good! I also held a dustpan beneath each branch as I sprayed the end of it, so the overspray wouldn’t cover the floor and gifts. 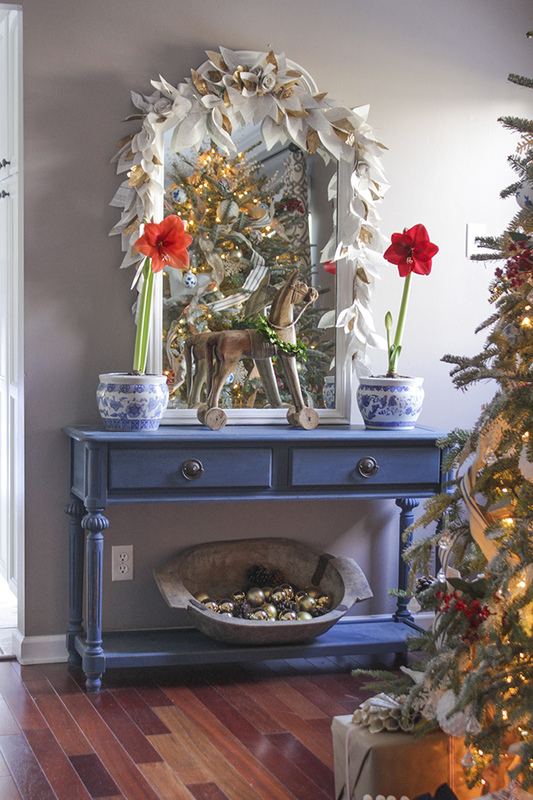 I pulled out my paper and embossed leaf garland from last year and draped it over this big mirror on top of the blue console table and I’m still so in love with that thing. I also got a wooden horse like all the other 5,429 bloggers that found it at HomeGoods and stood it between a couple of pretty Amaryllises that JUST BLOOMED YESTERDAY!! They were buds on Saturday. I love watching things bloom and grow. Aaaaaand now I’m singing Julie Andrews. 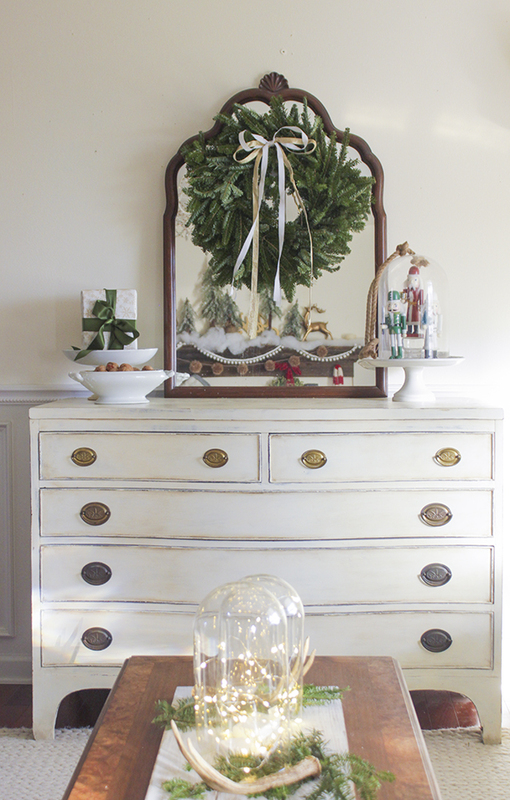 Speaking of boxwood wreaths… I sneaked another one on this old wooden ladder. Check out my tutorial for making a boxwood wreath here. The fun thing about adding a tree is the musical furniture game that commences. I love this new living room arrangement with the slipcovered chair I sewed on this side of the room with the trestle end table I built….and I’ll be sad to see the tree go in another month…. For now it is a happy change. Okay, okay… I know you are probably tired of pictures right now… just two more okay? Take a look at maybe the best decision I’ve made this Christmas season: Fresh tree in the master bedroom. Right?! Oh I love it! It smells so amazing, and it is so fun to crawl into bed and watch a little TV next to twinkling lights. It feels like a pretend cabin. Sort of. Okay, whew! YOU MADE IT! Thank you for visiting my blog and if there is something that caught your eye and you have a question about, PLEASE feel free to ask away in the comments (I WILL reply), or just tell me what you liked or loved! Also what would you call my home tour? Like… do you see a recurring theme that I could name it? I’m terrible at these things and I would love to know what you think! 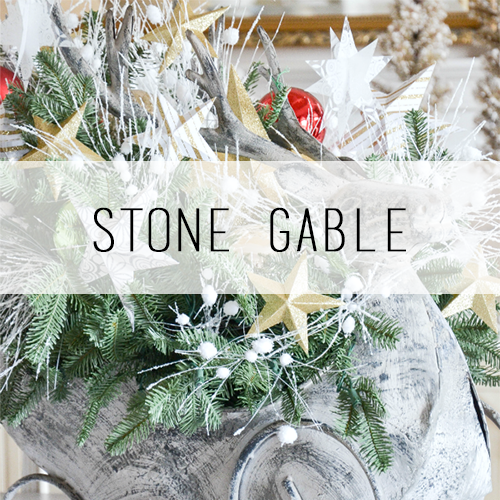 Check out the next stop in the tour, which will be live tomorrow, Yvonne from Stone Gable Blog! Oh my gosh this is definitely one of my favorite Christmas tours. I love everything and now I need a fresh Christmas tree with only lights in my master too. Love your master bedroom. Dude, you are killing it! You are so talented, your house is beautiful!! Rachel, it’s beautiful and cozy and warm and everything winter and Christmas!!!!! Love the added touches of the kids living (posing!!!) in the space. Simple. Elegant. Love it! You my love are incredibly talented and will take all the credit for ‘discovering’ you. This was by far your best work and it just keeps getting better! Congrats! I love everything about your house. You have put it together beautifully. I would love to know your wall paint colors and where you got the Noel pillow. Great job. Thank you so much! The living room wall color is Valspar Redstone Dakota Sandstone, the dining and kitchen is Sherwin Williams Timid Blue, and the Front room is Benjamin Moore Mascarpone. 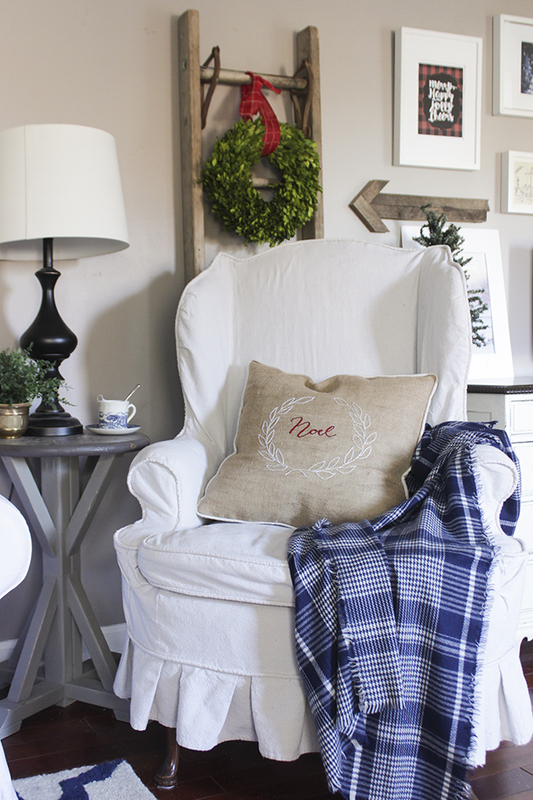 The Noel pillow I made last year, I sewed burlap onto a drop cloth back, then embroidered the word Noel with the laurel wreath around it. For the pattern I just printed off a laurel wreath, put it under the burlap and used a fine tip marker to trace the design. Same with the word, then just did my best to sew over the design I drew. WOW! 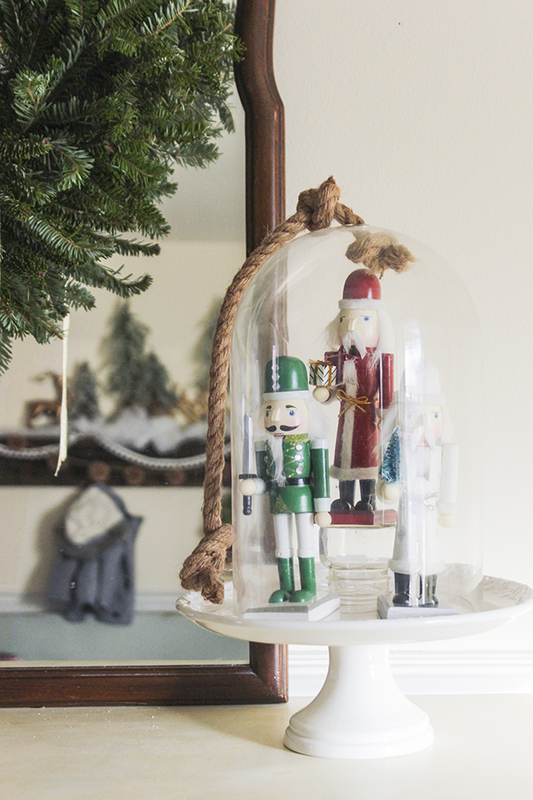 Your home all decked out for Christmas is absolutely charming. 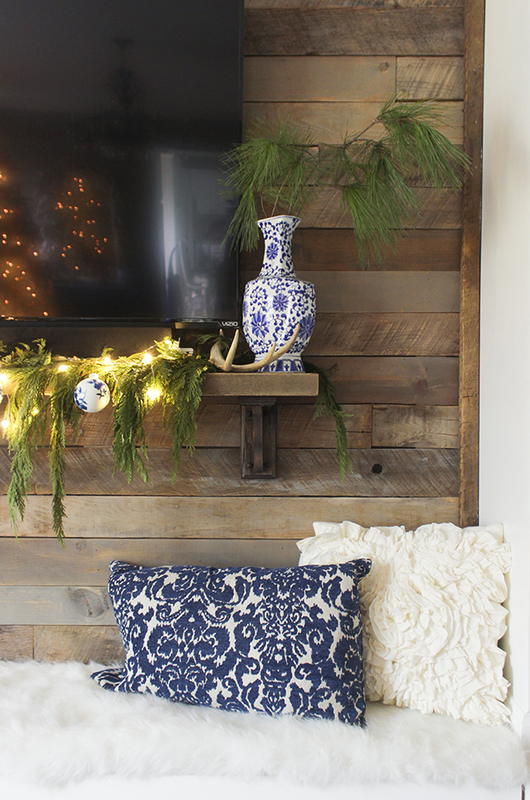 I think the entryway mantel is my favorite part, but I love the tree in the bedroom too. So many sweet touches. Oh, and I agree your backsplash is freakin sweet!! Rachel – your house is beautiful!!!! I love the clean white of everything. My question – where do you keep all the mess I know must be in the house somewhere. No one that does art doesn’t make a mess!! Have a wonderful Christmas!!! Everything is so lovely. So happy to be on this week’s tour with you! Happy Holidays. Holy Cow, Rachel. Your house and all the makeovers are amazing. I’m not in the Christmas decorating mood but looking at your pictures had me do a 180. Your home is gorgeous!! Love everything about this tour! I specially love all the wreaths. You are amazing!!! xoxo Beka. Oh My Goodness! 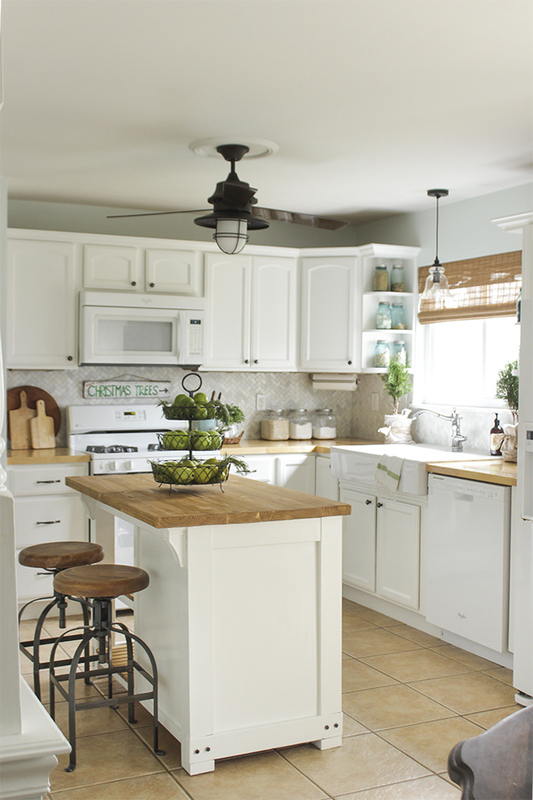 I love your home tour! I pinned it like crazy. Job Well Done! 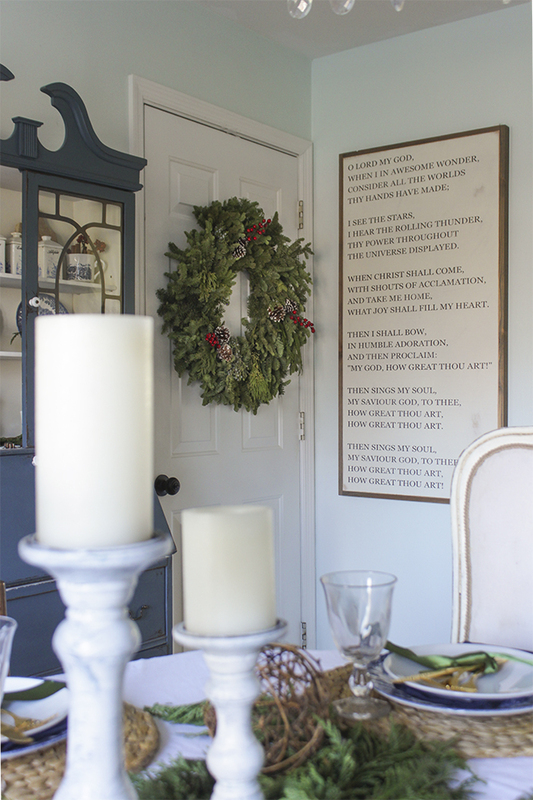 Such a treat to tour your beautifully decorated holiday home! Thoroughly enjoyed the tour and your children are so sweet. Love the red and white master decor. rachel, your home is always lovely, but i just love the christmas look you have going on! and your kitchen- WOW!!! your home is full of such beauty and love. Really beautiful ! I am in awe of you. I love everything you do. Hope you have a Merry Christmas ! Really pretty! Where is the red deer blanket from that is on the bed? Thanks! It is from HomeGoods! I just saw several there last weekend! Your home is so beautiful and so inviting! I want to just come on over and hang out (but not in a creepy way). 🙂 Your decorations are gorgeous and I’m definitely pinning to get some ideas for next year. Wow, just gorgeous! Too funny about getting them to pose and it actually working out so well. They are great sports. Lovely photos. Where to start?! The entry and that gorgeous church pew with the shelf, so pretty! The lovely quilt on the bed, your beautiful tree that suits your colours and unique style and the hand painted ornaments. 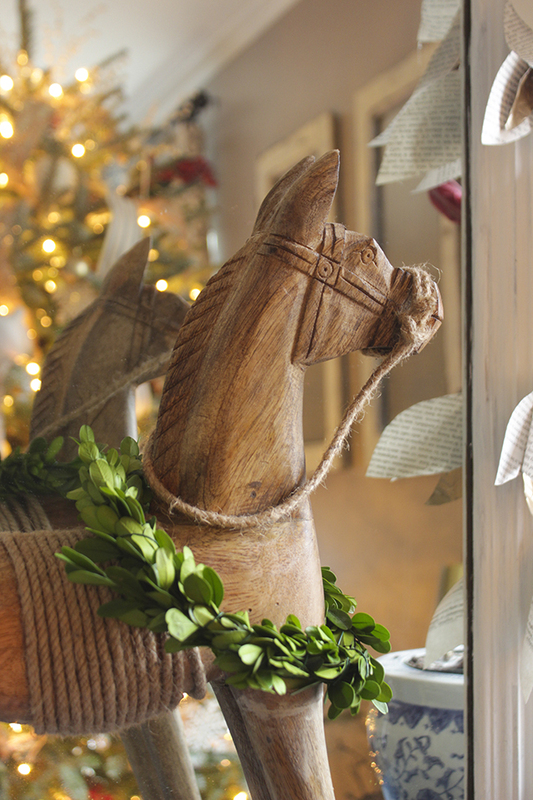 The boxwood on the ladder and the rocking horse and repeated elsewhere. Your kitchen -so lovely. My favourite is the wood pallet accent wall. We bought wood to use for a tv nook in our bedroom and this really inspires me to get at it. Thanks for sharing your lovely home and family. I must say that house looks spotless and it looks like something someone-pulled out of a magazine and through in someone’s house. Everything is in perfect order a perfect place got to say it looks pretty good. What a fabulous tour. You thought of everything to make it beautiful yet cozy. Like I want to come over and hang out! Love the pictures with your guys playing monopoly and with you and your daughter in the kitchen. You have a lovely and loving family, it is obvious! God bless! I am in awe!! Your home is beautiful! 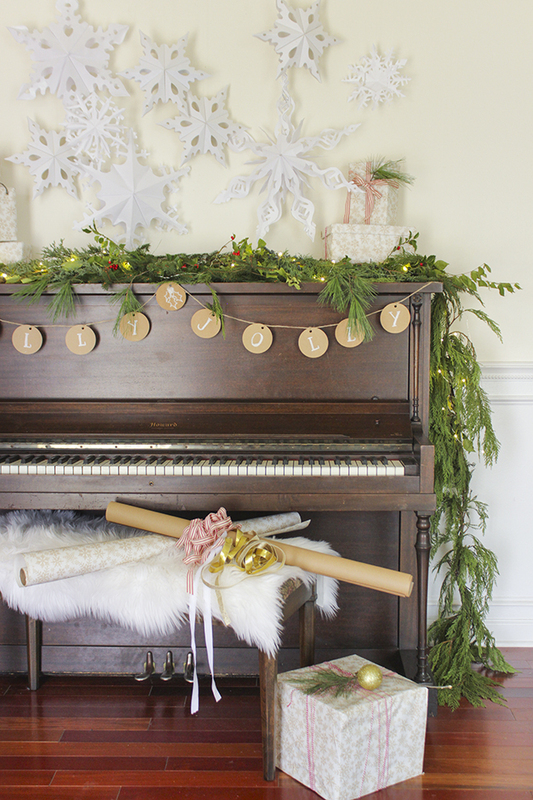 And your Christmas decor, magical! Loved your Christmas tour! There were so many great things, I’m not sure which one was my favorite!? 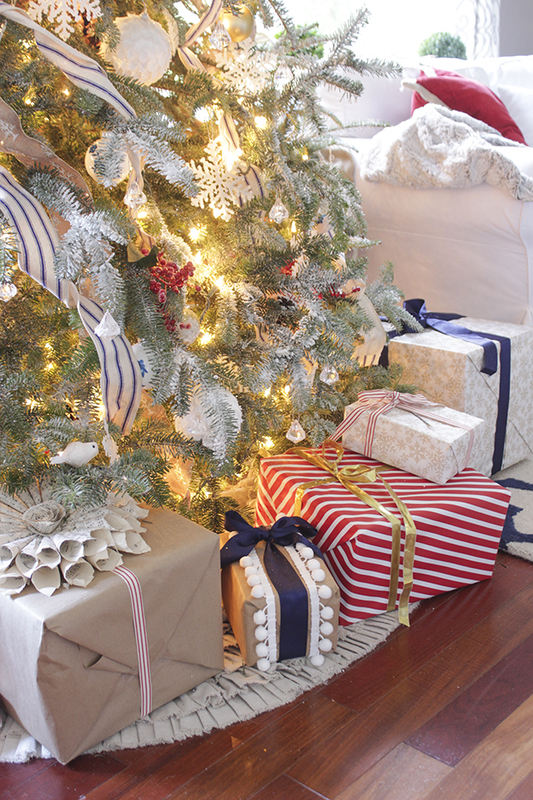 I love your Christmas tree, especially the blue & white ornaments and your farmhouse bedroom decorated for Christmas is beautiful!! Love the red & white…. Thanks for sharing – Merry Christmas! 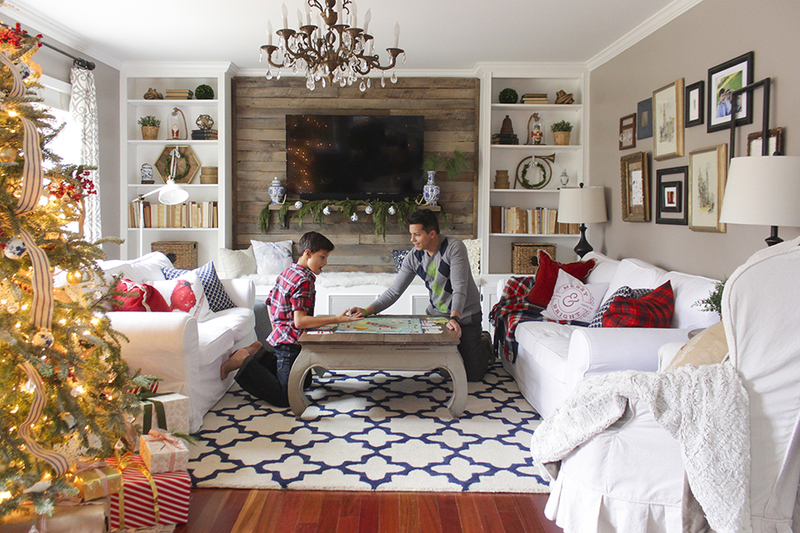 I LOVE your Christmas home tour! Yours is my fav by far! Everything looks beautiful ! It’s very natural looking, and not overdone at all. Love everything!! …. Wishing you a very merry Christmas from Canada!! ?? ? ABSOLUTELY beautiful, Rachel! I loved way too many things to list them…your home is packed full of charm. 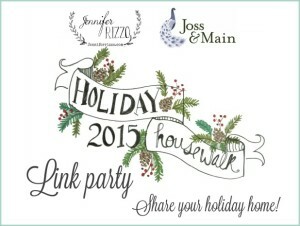 A personal home tour might be in order since we both live in STL 😉 Have a happy, healthy and safe holiday. HUGS! I feel like I’ve never seen your house before, you have done so many new things lately! It is looking just fantastic – really classic and beautiful but so personal and unique too. And your Christmas decorations are just fabulous. I slowly went through all the photos to really take it all in and then by the time I got to the end I’d seen so much beauty I can’t even really narrow down the things I love most. Your styling and photography are so good. I totally laughed out loud at how you said you were not getting too artsy and then just casually dropped that you made 3D snowflakes. I mean, what?! I can barely make a flat one that doesn’t look like it was made by a kindergartner! Your home is beautiful! I particularly like the bedroom with the twinkling lights and red accents. Hope your holidays are special!! Rachel!!!! Your house is gorgeous! 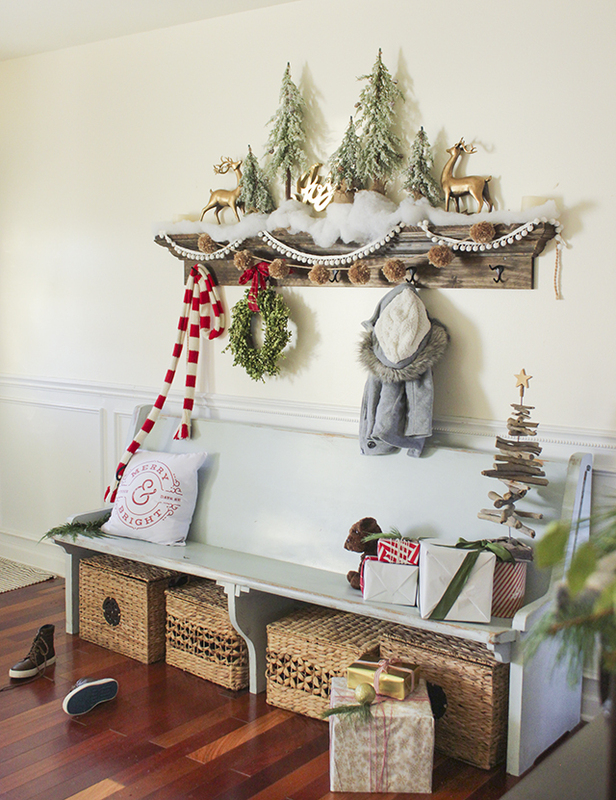 I absolutely loved every single space, your entryway with that gorgeous bench, and then the Christmas tree in your bedroom (genius and AWESOME!) but my absolute favorite are those beautiful ornaments you hand painted. Girl, you are so, so talented. 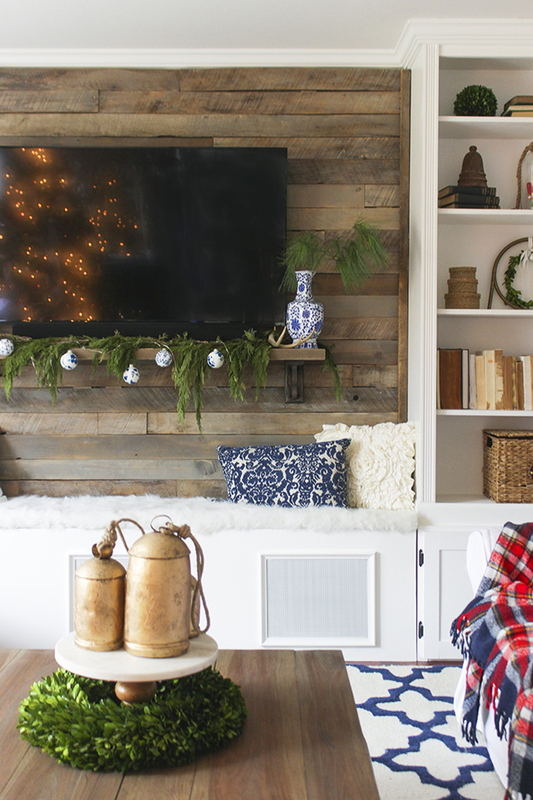 Love every bit of this home tour! 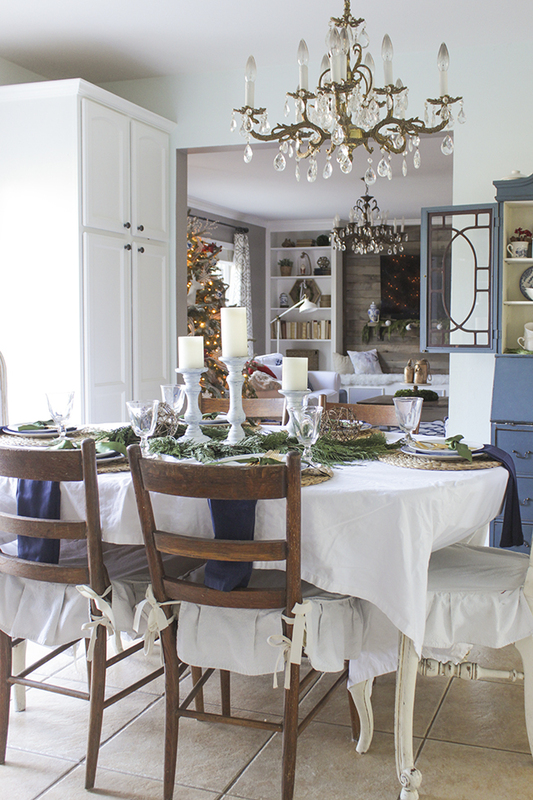 Rachel, your home looks GORGEOUS for the holidays! 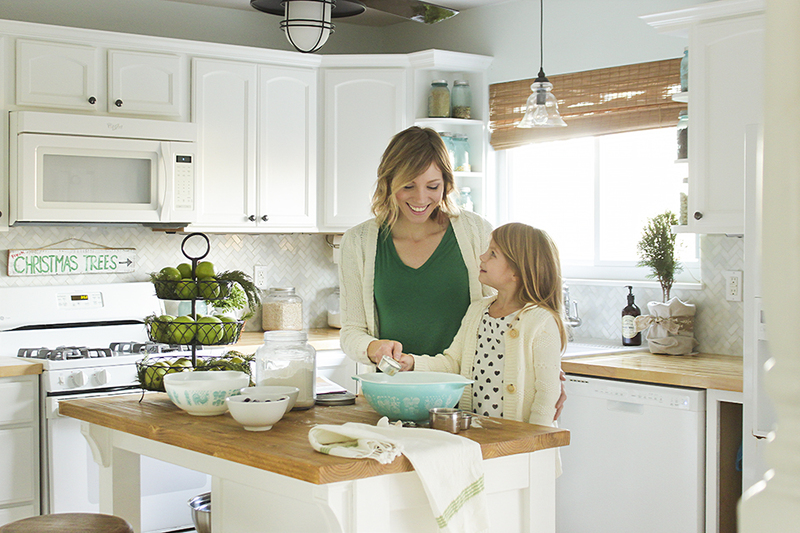 I love your new touches in the kitchen, and I adore the shots of your kids! Pinning so many of these images! Blown away by your home tour! 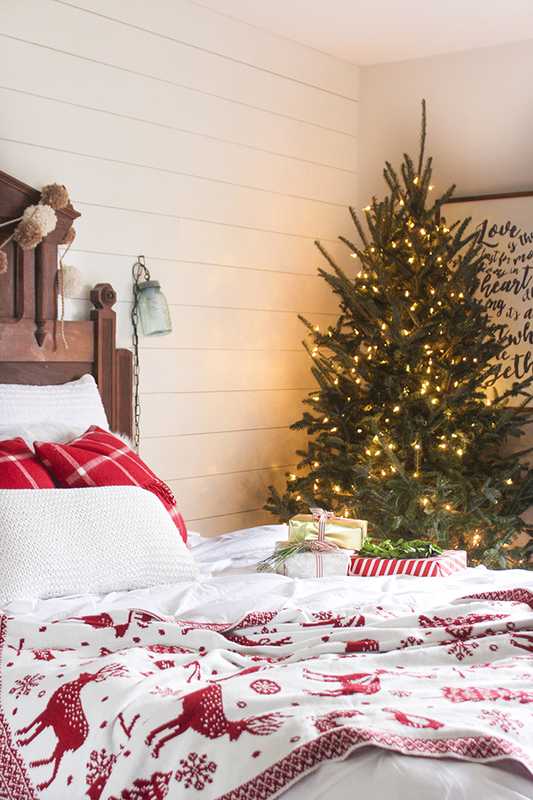 I loved every bit of it, especially the cozy bedroom with the red reindeer throw. Made me want to climb right in!! I love your furniture! Totally not the point of the Christmas tour, but it just caught my eye. 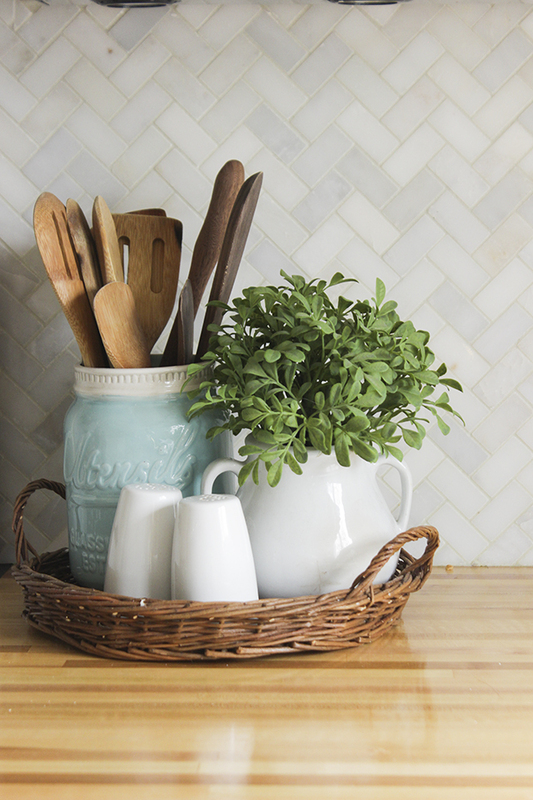 Your kitchen is so beautiful! 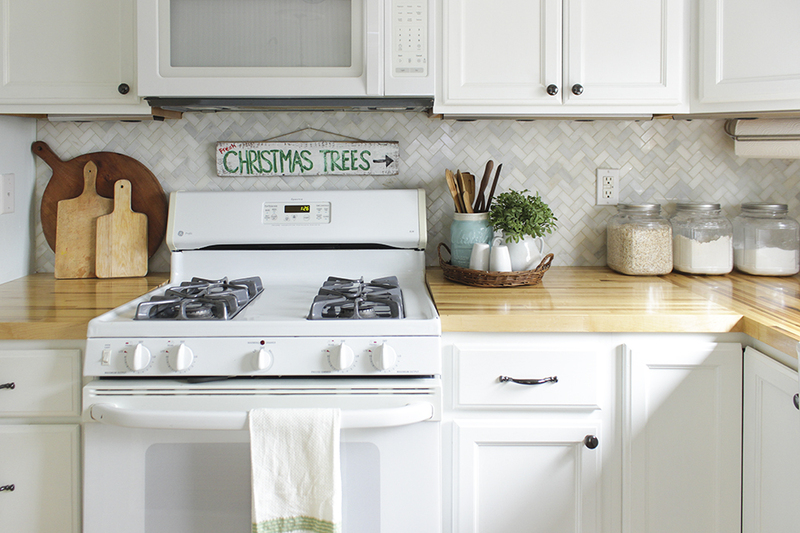 I love that backsplash. It feels so bright and fresh. I’m loving your “built ins,” also. I’ve been looking for something to do with my living room tv and I think I’ve found it! I may be stealing your idea. Thanks!! 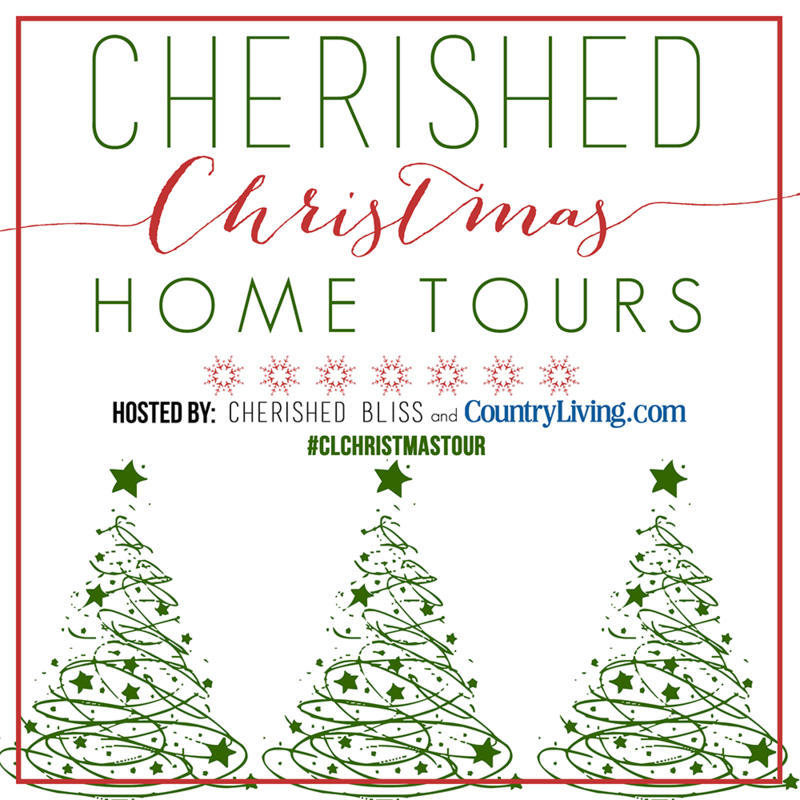 Just found my new favorite home tour this year! You rocked it girl! Absolutely gorgeous. I can’t quite get over it. 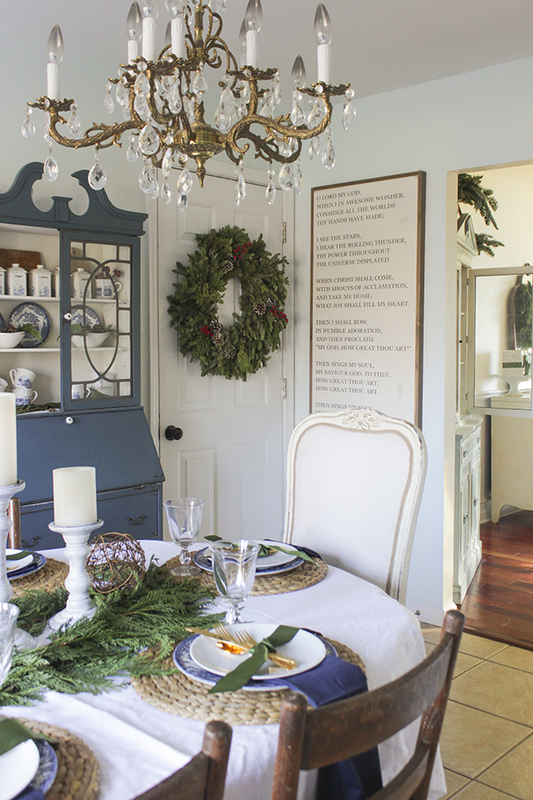 Your home is perfection – straight out of the pages of a Christmas magazine. Love how homey it feels while being so beautiful! Your entire tour is so beautiful!! 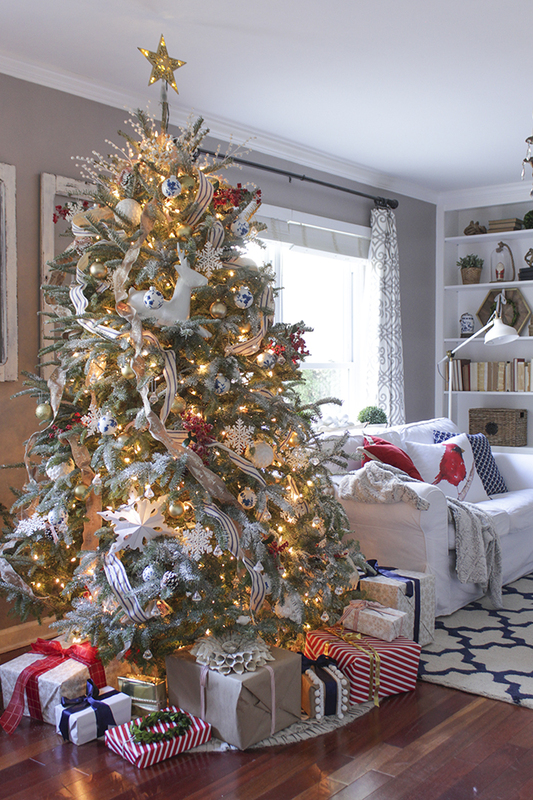 I love the tree in the bedroom, the bookshelf styling, and your tree is just gorgeous! Everything is oh so pretty!! I love everything about your home! Just beautiful. Do you know what the style of your bed frame is called? My grandfather had one similiar growing up and I cannot figure it out. Thank you for sharing! Your house is absolutely beautiful! 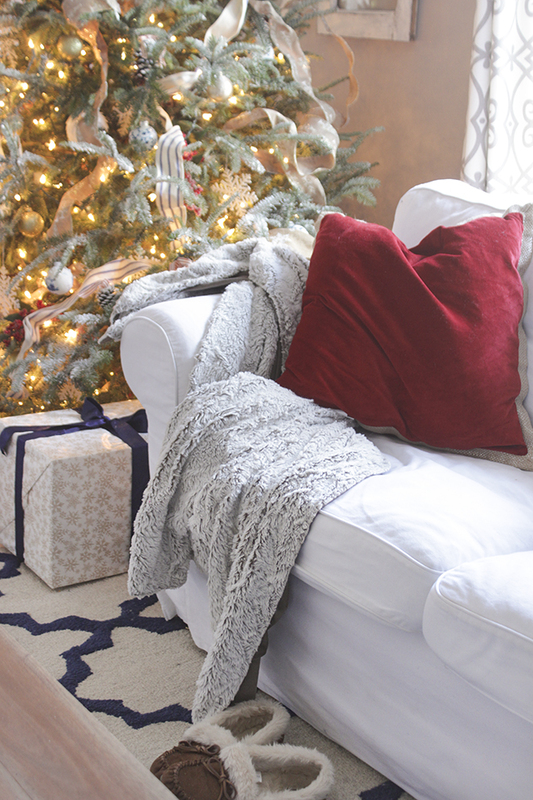 Where did you get your blue and white rug in your living room?